If your kid doesn't speak Mandarin at home and would like her/him to be bilingual in the future, you have come to the right place! 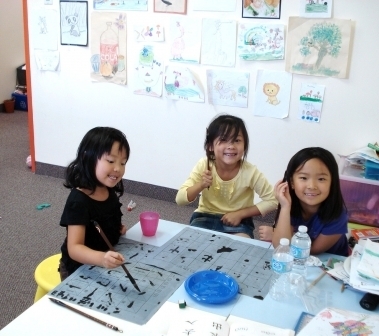 We teach young kids to learn Mandarin with fun and easiness. Many parents want to make sure their child is learning enough characters and writing. However, learning a language is not just about how much words you can write, but it is about if you can use them to communicate your thoughts clearly. That's why we focus on communication rather than just writing mechanisms. We teach children through story-telling, interactive Chinese games and songs. If you are a regular goer to School Board Chinese School and have already built a certain number of vocabulary, you might want to have the ability to put them together into sentences and articles. We can help you write stories and understand more Chinese culture. If you never been to a Chinese class before, you are also welcome to learn from start. We have a selective range of textbooks and classes for you to complete your goal. A regular class contains 20 students with only 1 teacher. Our Mandarin teacher, Julie used to teach at the school board. She says that it is really hard for her to pay attention to every kid. Our class size are small and for bigger class, we have teaching assistants. A lot parents don't realize this, but the textbook used by the school board is actually a little too hard for kids who were born in North America, and too easy for kids who already studied in China. Finding the right textbook is the challenge for every Mandarin teacher. We use a textbook series called Yes!Chinese. It is designed for young kids with little Chinese background. It is interactive and easy to learn.